Celebrate Hanukkah in your classroom with these printable math worksheets, and word puzzles, reading comprehension stories, and cut-out crafts for students. Plot the points on the grid and connect the dots to make a dreidel picture. Find the hidden words in the puzzle. Words include dreidel, oil, Festival of Lights, and many more. Students unscramble the Hanukkah words, such as dreidel, family, candle, menorah, and others. Cut out the paper menorah and attach the candles. Color, cut, fold, and glue to make a dreidel. Here's a story about a boy that is invited to a Christmas party. He's loved to go to a party with his friends, but he's afraid he'll feel out of place because he's Jewish and his family celebrates Hanukkah. On no! The little mouse is being chased by a giant dreidel! Students can write a Hanukkah story to explain the cartoon. Solve the basic addition problems with sums up to 18. 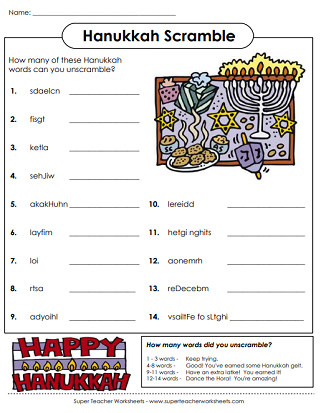 This worksheet is decorated with Hanukkah-related pictures. Solve the basic subtraction problems with differences up to 9. This worksheet is decorated with Hanukkah clip art. Students will need to regroup to solve the subtraction problems on this worksheet. This page is has Hanukkah-related illustrations. 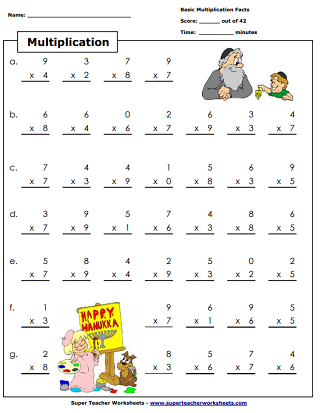 Solve the basic multiplication problems with factors up to 9. 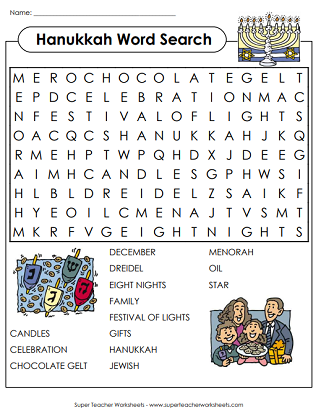 This sheet features Hanukkah graphics. This spelling unit contains a word list, puzzles, ABC order activities, flash cards, a word wheel, and puzzles. Approximately 1st and 2nd grade level. Printable worksheets for celebrating winter time in the classroom.